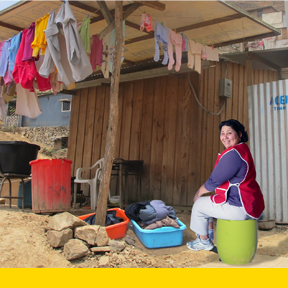 GiraDora, a human-powered washer and spin dryer, increases the efficiency and improves the experience of hand-washing clothes for people living without access to running water. The user sits on the drum-like appliance and pumps the pedal with the foot, which agitates, cleans, rinses and then spin dries clothes. Local assembly and an innovative business plan with three revenue streams for micro-entrepreneurs provide supplemental income. For under $40, GiraDora’s comfortable and ergonomic operation more than doubles productivity, increases health, instills dignity and affords opportunities to begin breaking the poverty cycle.